Alan Gillespie was born on 16 November 1922 in Hesket, Westmorland. He was the second of the four children of Robert and Margaret Gillespie. His father was a railway porter. The family then moved to Long Marton, near Appleby. Alan Gillespie went to the village school in Long Marton and then Appleby Grammar School. After leaving school he worked as a clerk in a solicitor’s practice before volunteering for the RAF in 1940. 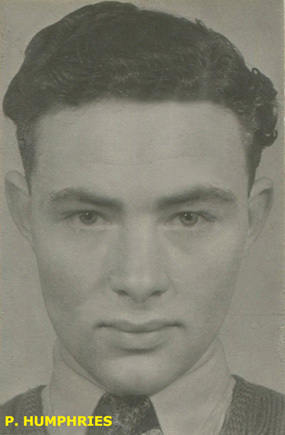 He was eventually selected for aircrew and sent to Canada for training in September 1941. After returning to the UK, he underwent further training and met up with Norman Barlow and Leslie Whillis at 16 OTU in July 1942. All three were eventually posted to 61 Squadron in September 1942, and did their first operation together over the Alps to Turin on 20 November. By March 1943, Barlow and Gillespie had both completed their tours. On their penultimate operation, a trip to Berlin, flight engineer Leslie Whillis had been left behind, in favour of Gp Capt Reginald Odbert, flying as second pilot. Odbert was the station commander at RAF Syerston, a popular Irish rugby international who had joined the RAF before the war and captained the RAF rugby team. He was killed in a flying accident in June 1943. This Air Bomber has carried out 30 successful sorties on all the main targets in Germany and Italy, including six attacks on Essen and five on Berlin. He has frequently obtained excellent photographs, one of his best being the aiming point on Krupps. He has shown himself cool and collected under heavy fire in the target area and has set an excellent example to others in his crew and the rest of the squadron. Strongly recommended for the award of the Distinguished Flying Medal. When Barlow set about putting together a crew who would accompany him on to 617 Squadron Gillespie and Whillis, who had been with him since their training days, were obvious choices. Both were commissioned two days before the Dams Raid. Whether they had time to move from the Sergeants’ to the Officers’ Mess is not recorded. It was therefore as a newly fledged Pilot Officer that Alan Gillespie met his end. Flying in the nose of the Lancaster at treetop level, he may have seen the pylon they hit near Haldern a split second before impact. Alan Gillespie and his comrades were buried first in Dusseldorf, but after the war they were reinterred in Reichswald Forest War Cemetery. The DFM he had won a few weeks before was presented to his family posthumously. I think Alan was born in 1922, not 1920, although I’ve seen both. Certainly his gravestone gives his age as 20, which makes 1922 more likely.